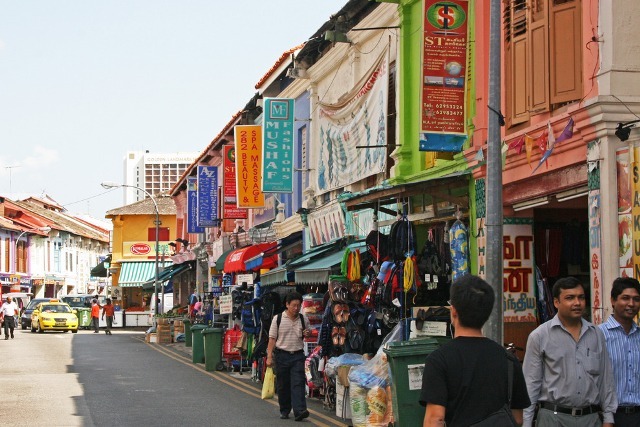 Most of the shops are concentrated at a certain portion of Serangoon Road, which is the main road of Little India. You can easily visit the stretch of shops along this road by foot, as they are not far from each other. You will find shops for gold jewelry, accessories, ethnic Indian clothing, saris, lots of spices, and of course, curry. If you are a vegetarian, you will be pleased to find many vegetarian shops here. Aside from Serangoon Road, other shopping areas can be found along Buffalo Road, Kerbau Road, Upper Weld Road, and Campbell Lane. One of the most popular shopping destinations in Singapore is found in Little India: Mustafa Centre. The place is known to sell a wide range of products from home appliances to watches and jewelry to fresh fruits and yes, even airline tickets. The items are given at great discounts. Mustafa Centre is perhaps the shopping mall in all of Singapore to offer the lowest prices. To top it all off, the shopping complex is open 24 hours a day, 7 days a week. Tekka Mall in Serangoon Road is the only air-conditioned shopping centre in the area. However, it is not as busy as the shops outside, as people are more drawn to the more populated albeit smaller shops along the road. Tekka Mall has a decent food court, and if you want to skip the spice-laden Indian foods, you can have your meal here because they serve non-Indian cuisine. But if you’re up to eating authentic Indian food, you can go to Tekka Market in Buffalo Road, which is within walking distance from the MRT station. Tekka Market boasts of numerous food stalls offering Indian food as well as Chinese and Malay cuisine. This place is one of the tourist attractions in the area, and people flock here to sample the different gastronomic offerings. There are also restaurants around the area. A popular Singaporean dish is the fish head curry, which is basically a large fish head cooked in hot and spicy curry sauce. Some restaurants serve the Chinese variation of the dish, which is a lot less spicy. Vegetarian food is served in many restaurants. The best way to eat Indian food is the way the locals eat it – by hand. This way you get to taste not just the food but the culture as well. A number of hostels and hotels can be found in Little India. Accommodation rates range from as low as $20 to $100 per day. The more expensive hotels can cost up to $120 to $180. You may also find accommodations offering dorm-type rooms where you pay only for bed space.